In the control of parasitic diseases, the correct diagnostic tool at the right time will accurately assess the burden of disease, monitor the impact of the disease control intervention and save valuable resources. Knowing where and when to use which diagnostic tools is paramount to the control of parasitic diseases of public health and veterinary importance. A recent study compares two different diagnostic tools in use for schistosomiasis, presenting findings that have important implications for public health policy in the context of schistosomiasis control and elimination efforts. The ideal goal of a parasite is for it to move within and between hosts undetected and undisturbed, so it is hardly surprising that the development of ‘gold standards’ for locating, isolating and quantifying them is an on-going process and what keeps many parasitologists fascinated by these peculiar creatures. Parasitic protozoa, nematoda, trematoda and cestoda of public health and in many cases veterinary importance, are endoparasitic (i.e. living within the definitive hosts internal organs and tissues). This lifecycle choice is not only more damaging for the host, but also means that the root causative agent of illness, the mature parasite within the host, is not easily accessible without some kind of intrusive method. Therefore most measures to determine presence of the parasite within the host often rely on using biological markers in host blood, serum and excreta. 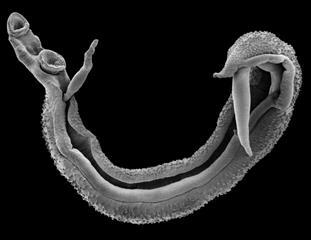 Schistosomes are a group of parasitic blood flukes of the class Trematoda, and broadly cause two distinct forms of disease in humans: urogenital and intestinal schistosomiasis, the adult worms living and mating within the venules surrounding the urogenital region and intestines respectively. This neglected tropical disease infects an estimated 190 million people a year predominantly in sub-Saharan Africa, and efforts to treat and curtail morbidity in endemic populations is conducted through large-scale mass drug administration (MDA) of preventative chemotherapy using praziquantel. Ideal diagnostics for schistosomiasis need to consistently provide the correct diagnoses to know whether treatment is necessary, but they also need to quantify the burden of disease a host is enduring. This quantification allows the examiner to determine the extent of on-going transmission and re-infection in a study area receiving regular treatment, as well as determine the impact and effectiveness of ongoing treatment interventions. With a constant risk of parasites becoming resistant to many anti-parasitic drugs, it is also pertinent to quantify parasite abundance so that drug efficacy can be accurately assessed, i.e. to establish whether there had been a significant, if not complete, reduction in parasite load following a targeted treatment. A recent research article published in Parasites & Vectors by Joaquin Prada and colleagues encompasses some of these issues by comparing two widely used diagnostic tests for intestinal schistosomiasis (caused by Schistosoma mansoni) in Uganda. The authors do so by comparing the difference between the two traditional diagnostics, a Kato-Katz thick smear and a newer and increasingly popular circulating cathodic antigen test (CCA) for schistosome detection. Kato Katz thick smear technique involves using light microscopy to manually count the number of schistosome eggs from a specific amount of stool sample. Although, this technique is highly specific, it most importantly lacks in sensitivity, which can result in false negatives from positive individuals. These false negatives are often due to low or varying schistosome egg outputs, meaning that the estimation of disease burden through egg counts can also be skewed. Circulating cathodic antigen test (CCA) detects S. mansoni gut antigens that are regurgitated by the worm during active blood feeding and are therefore present in host urine. The test is sensitive (although not 100%), and is regarded as a “point-of-care” diagnostic enabling quick, non-invasive sampling and requires no sophisticated equipment to view results. As these schistosome antigens disappear from the urine within 24-48 hours of the host being treated and fully clearing the infection, it enables differentiation between active parasites and refugia (i.e. juvenile parasites remaining in the body post-treatment that may not produce eggs, these require over a week to reach maturity). When a gold standard isn’t the gold standard? Public health policy decisions regarding intestinal schistosomiasis are based on prevalence calculated by Kato-Katz, however CCA is increasingly being used in mapping the disease and could be used in forming policy if the relationship between Kato-Katz and CCA across pre- and post-treatment settings is better understood. Prada and colleagues therefore modelled the relationship of prevalence and intensity judged from Kato-Katz and CCA results from children in the Mayuge District (Uganda) at three time points: before, one month post- and six months post-treatment. Although Kato-Katz is regarded as the ‘gold standard’ for S. mansoni diagnosis, it was in fact CCA that was modelled as the best predictor of schistosomiasis prevalence, and in particular after treatment had occurred, likely due to higher CCA sensitivity at lower post treatment infection intensities. Model outputs also dispelled the previous uncertainty on interpretation of “trace” readings (i.e. test providing a weak positive), as these researchers concluded that these were most likely associated with truly infected individuals. In these high endemnicity settings, truly uninfected individuals with trace results make up only a small minority (15%), giving a brilliant guideline for control programme managers having to deal with these “trace” results. When, where and which test? These workers provide evidence that future surveys should follow a multiple diagnostic approach depending on the epidemiological setting of the targeted area. As highly endemic S. mansoni regions are often associated with high transmission areas and therefore individuals with high infection intensities, Kato-Katz is capable of identifying these heavy infections. However when implementing MDA, as in the Mayuge District studied here, the huge drops in infection intensities of treated individuals necessitate the use of more sensitive diagnostics such as CCA to assess true prevalence. It is research such as this that should directly feed into future policies, as picking the correct diagnostic tool at the right time will save resources and most importantly accurately assess the burden of schistosomiasis and the impact of disease control interventions as moving towards elimination. Are parasite-induced behavioural changes and sterility linked? Tom completed his BSc in Zoology at the University of Manchester, before carrying out his MSc in Medical Parasitology at the London School of Hygiene and Tropical Medicine. He is now a PhD candidate based at the Natural History Museum and Cardiff University focusing on the transmission and genetic relationship between schistosomes, their intermediate host snails and the environment. Tom is also a student representative for the British Society of Parasitology council.